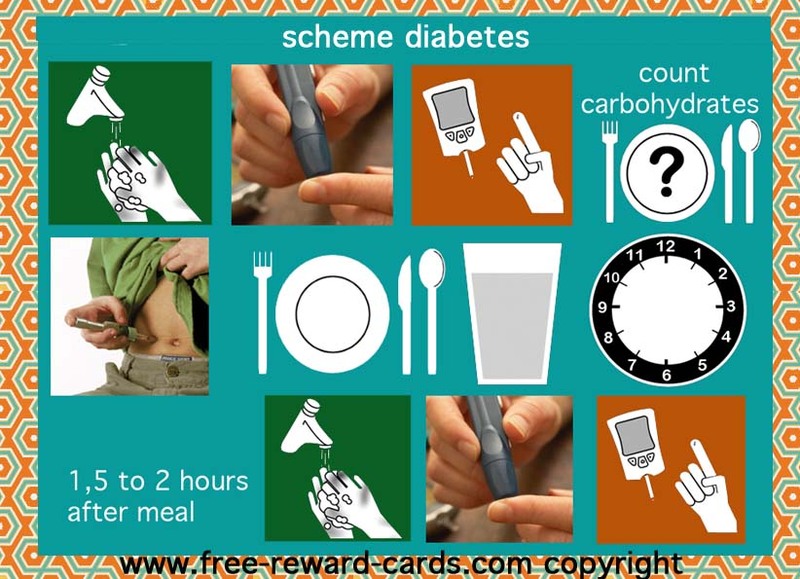 Diabetes dialy rhythm chart for children with pictures of the various steps. Order: 1. Wash hands with soap 2. blood tests to see what the blood levels are 3. Carbohydrate counting 4. give insulin with the lancing device 5. Child may eat (breakfast, lunch, dinner) 6. After 1.5 to 2 hours again the blood glucose measurement and then it is to wash hands, and prick blood. TIP: plasticizing the map and fill the time with whiteboard marker. Then you can use the card at each meal again. All these daily rythm pictogram cards are free printable via www.free-reward-cards.com. The cards are ment to make parenting more fun and easy for parents and children.